The Dunedin City Council OWNS the Carisbrook Stadium Trust files, note. Mon, 8 May 2017 at 1:40 p.m. Message: Attached is the letter from the Ombudsman Office. I have sent a response to the Ombudsman letter. Jaw-dropping concepts for an iconic new national stadium have been pitched to Auckland Council, proposing a state-of-the-art arena be submerged into the city’s waterfront. A portfolio of spectacular designs can be revealed from documents delivered to the office of Auckland Mayor Phil Goff last month. 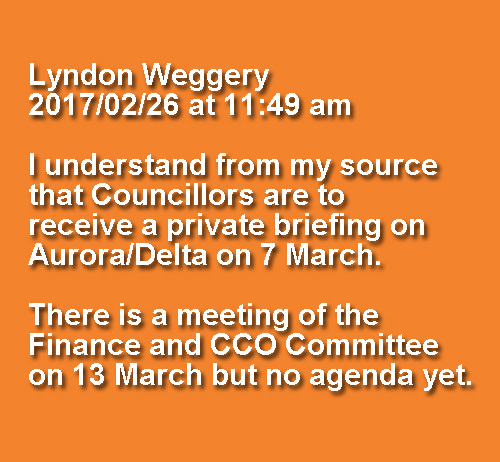 The Herald on Sunday has obtained them through the Local Government Official Information and Meeting Act [LGOIMA]. Dubbed The Crater, the idea centres on a subterranean multi-events venue, inverting conventional design by building below ground rather than above. Created by Auckland design and marketing figure Phil O’Reilly, three potentials factor in a core concept of a sunken bowl-type arena, as well as renderings of a roofed version. A third concept incorporates new cruise ship terminals that would flank the facility, although O’Reilly said the general idea could also work inland if the waterfront was dumped as a location. […] O’Reilly said as far as he is aware, the submerged venue would be the first of its kind anywhere in the world and was a chance for Auckland to build an iconic landmark that would be recognised the world over – but in keeping with Auckland’s natural volcanic landscape. […] Although not as large in scale, likely between 30,000-50,000 capacity, O’Reilly said a truly cutting-edge design could see the Kiwi venue punch way above its weight and become as recognised as some of the most famous on Earth. Sent: Monday, 24 April 2017 5:03 p.m. Please see below a response to your LGOIMA request re Mayoral vehicles. 1. I understand there is a DCC vehicle dedicated for use by the Mayor of Dunedin, is this correct? If so, is the vehicle owned by DCC, or is it leased? The Mayor pays for full private use of the vehicle as per the determination set out by the independent Remuneration Authority. The insurance cover for the mayoral vehicle is as for all other fleet vehicles. Any authorised driver is covered. 3. What is the make, model, colour, year and registration of the mayoral vehicle? Please state for all vehicles designated for mayoral use in the period October 2010 to April 2017, if any. Please see the attached spreadsheet. I have not provided registration plate details and these are withheld to protect the privacy of natural persons pursuant to section 7(2)(a) of LGOIMA. 4. What has been the annual mileage clocked for the mayoral vehicle on official business in the period October 2010 to April 2017? Annual mileage is not recorded and so the information requested does not exist. 5. Does the mayor also retain the vehicle for his own casual use when not on official business? If so, is this mileage logged separately and what has been that annual mileage clocked in the period October 2010 to April 2017? Or please supply the annual mileage clocked for all use of the vehicle in the period October 2010 to April 2017? The Mayor pays for full private use of the vehicle as per the determination set out by the independent Remuneration Authority. No records of annual mileage are kept. 6. Designated driver(s). Besides the mayor, are there other dedicated drivers specified for this vehicle? (see 2. above). Please identify the drivers – if for privacy reasons names cannot be supplied, state by position or role to include council staff, elected council representatives (councillors), or the mayor’s family. The vehicle is able to be driven by any authorised driver. 7. See 4. above. How does this mileage compare with the annual mileage recorded for a mayoral vehicle (if any) used by previous mayors, where this is known? For example, for Richard Walls, Sukhi Turner and Peter Chin. No mileage records are held. 8. In the period October 2010 to April 2017, have any vehicles assigned for mayoral use been badly damaged or written off? Please provide vehicle identification (make/model/colour/year/registration), date of vehicle crash or incident, crash site or incident location; and, where relevant identify whether this was an injury/serious injury/non injury crash (cross out whichever does not apply). Yes. A Hyundai Santa Fe was written off in Jan 2017 following an accident involving serious injury near Roxburgh. The insurers did not identify a cause of the accident. 10. See 6. above. Was the mayor or another officially designated driver identified for each vehicle crash or incident listed at 8. above? 11. How recently was the mayoral vehicle replaced following a vehicle write-off? Did DCC’s insurance cover and budgets meet the full cost of vehicle replacement and other associated costs such as accident victim transfer to hospital? Please itemise all costs to DCC. 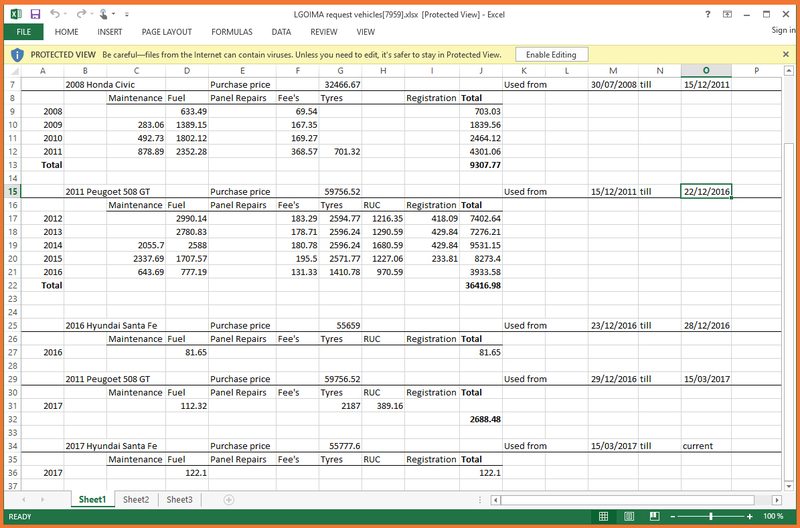 Refer to the attached spreadsheet. DCC received a full insurance pay-out. 12. Further to 3. above, please confirm the make, model, colour, year and registration number of the present mayoral vehicle and its date of purchase or commencement of lease by DCC. Please respond by email within 20 working days. Thanks. Refer to the attached spreadsheet. I have not provided registration plate details and these are withheld to protect the privacy of natural persons pursuant to section 7(2)(a) of LGOIMA. Given I have withheld information, you are entitled to a review of the decision by the Office of the Ombudsman. I have cc’ed [DCC Governance Support] on the response for record keeping purposes. Sent: Wednesday, 19 April 2017 9:28 a.m.
We received your request on 18-April-2017. We will endeavour to respond to your request as soon as possible and in any event no later than 17-May-2017, being 20 working days after the day your request was received. If we are unable to respond to your request by then, we will notify you of an extension of that timeframe. Your request is being handled by Sandy Graham. If you have any queries, please feel free to contact her on 03 477 4000. If any additional factors come to light which are relevant to your request, please do not hesitate to contact us so that these can be taken into account. Sent: Sunday, 16 April 2017 1:19 p.m.
We support public access to official information. Our obligation under the Local Government Official Information Act 1987 (the Act) is to provide you the information requested as soon as reasonably practicable unless there is a good reason for withholding it. • We will let you know as soon as we can (and in any case within 20 working days) whether your request will be granted or declined, and if the request is declined why we have declined it. • In some cases it may be necessary for our decision to be made after 20 working days. When this occurs we will advise you the anticipated delivery date together with the reason why it is necessary to extend that time within the 20 working days. • If your request is complex or requires a large amount of collation and research, we may contact you with a view to either refining your request or discussing the possibility of charging for aspects of your request in line with the DCC charging policy. • If we decide to release the information, we aim to provide it at the same time as we give our decision. If this is not possible we will provide the information as soon as reasonably practicable. The timeliness of our decisions and the reasons for them are reviewable by the Office of the Ombudsman. You can view the Ombudsman’s guidelines for the processing of information requests at http://www.ombudsman.parliament.nz or by calling freephone: 0800 802 602. 9. See 8. above. What was the official cause of each vehicle crash or incident as determined for DCC’s insurance claim (if any); and or as claimed in the official CAS report* involving a DCC vehicle, a copy of which may be held on DCC files? 12. Further to 3. above, please confirm the make, model, colour, year and registration number of the present mayoral vehicle and its date of purchase or commencement of lease by DCC. Please respond by email within 20 working days. Thanks. 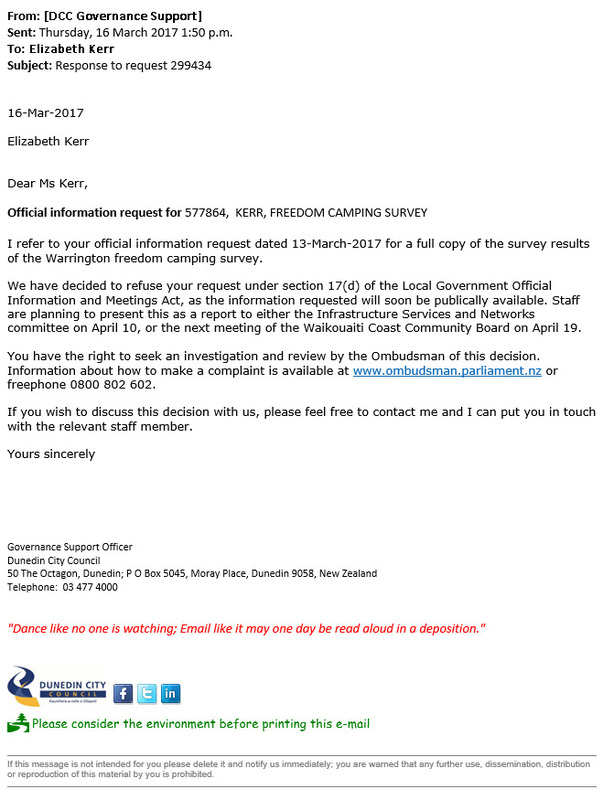 DCC’s delay in providing official information on freedom camping numbers (Which Is Available) appears to equate with what happened over LGOIMA requests lodged after the South Dunedin Flood of June 2015. Delay, derferment, and obfuscation occurred then as now. There is no reason to believe anything has changed internally, magnified by today’s ‘official response’. Sent: Monday, 13 March 2017 7:55 a.m.
1. We will let you know as soon as we can (and in any case within 20 working days) whether your request will be granted or declined, and if the request is declined why we have declined it. 1. In some cases it may be necessary for our decision to be made after 20 working days. When this occurs we will advise you the anticipated delivery date together with the reason why it is necessary to extend that time within the 20 working days. 1. If your request is complex or requires a large amount of collation and research, we may contact you with a view to either refining your request or discussing the possibility of charging for aspects of your request in line with the DCC charging policy. 1. If we decide to release the information, we aim to provide it at the same time as we give our decision. If this is not possible we will provide the information as soon as reasonably practicable. 5. what type of vehicle they were in. I’m told the survey ran for two weeks; and that it was conducted by Ashley Reid. I request a full copy of the survey results (with names of campers redacted for privacy), to be received by email at earliest convenience. I note hearings for the Proposed Reserves and Beaches Bylaw will be held this week. Prompt receipt of the survey information would be enabling. Thanks. 1. The Reserves and Beaches Bylaw review that had hearings this week did not include a review of freedom camping; freedom camping is specifically excluded from this bylaw review. The freedom camping bylaw review is heralded to take place in about a month’s time. 2. The point numbering error in the response of 13 March above is the DCC’s. 3. The running foot, or footer, italicised in red (“Dance like no one is watching; Email like it may one day be read aloud in a deposition.”) in the redacted screenshot above, has been raised with senior staff this afternoon and has since been sorted. 15. What is the average length of stay per vehicle at the Domain? 14) We do not perform a count of freedom campers at each site daily. An estimate may be available as a result of a recent survey that was conducted across camping sites within the city. Please advise if you wish to refine your request to include an estimate of numbers. 15) See the answer to question (14) above. WE have the information —WE are going to control it. Let’s play cat and mouse, if it turns out the information is ‘maybe’ awkward or not in OUR political favour [before a Bylaw review]. Besides, WE need processing time to [‘line up ducks’] before the information, analysed…… hits the iPads of elected representatives. Micromanaging is GOOD. Vive la DCC Operatives ! !